The Fourth of July is one of the best holidays of the year, and it’s no wonder. 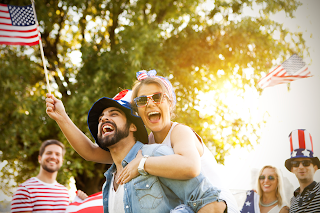 Other than the mere principle of the United States gaining its independence, July 4th brings bright fireworks, backyard barbecues and everything America-themed. 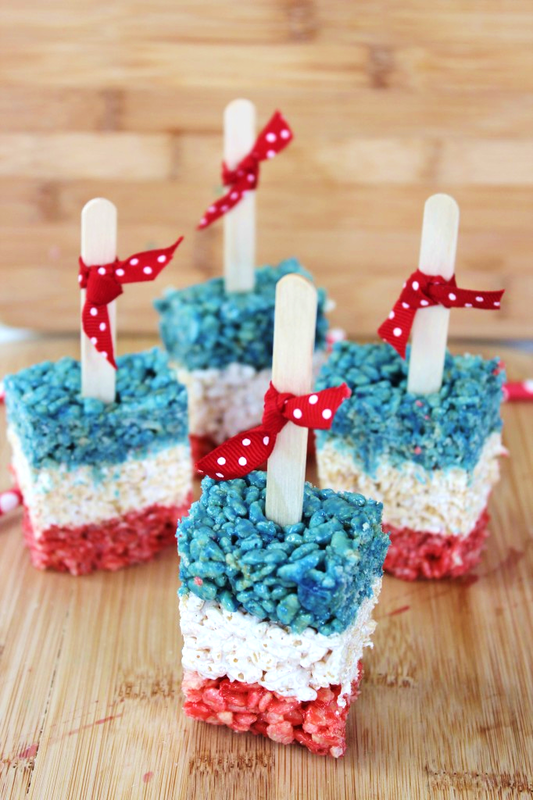 Here are three fun and easy recipes to bring the red, white and blue to the dessert table at your upcoming Independence Day party! Sprinkle a little extra patriotism into your Fourth of July party with these super-easy vanilla cookies. These treats are made from cake mix and should only take about an hour from start to finish, and they stay soft and fresh for up to three days! In a large, microwave-safe bowl, melt the butter. Stir in the vanilla cake mix, then add the beaten egg and extract. Pour and stir in the white chocolate chips and the sprinkles. Roll the dough into small balls. Gently smash the balls with your palm on the baking sheet. Bake for 8-10 minutes. Allow the cookies to finish baking on the baking sheet for another 5-7 minutes after you take them out of the oven. 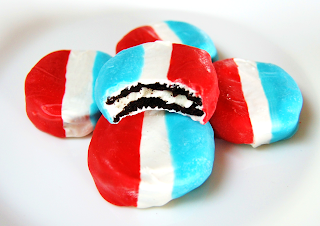 Take a dip in our country’s colors before you take a dip in the pool at your Independence Day party with these red, white, and blue Oreos! Besides, what better treat to eat on America’s favorite day than America’s favorite cookie? Dip each cookie in red chocolate to coat one end. Allow excess to drip off, and place back on lined sheet. Allow to set for 15 minutes. Dip each cookie in blue chocolate to coat opposite end. Allow excess to drip off, and place back on lined sheet. Allow to set for 15 minutes. 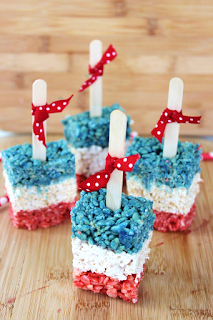 Krispies Treat Pops will be as much of a crowd pleaser as that Black Cat in the night sky. Line a loaf pan with parchment paper and lightly spray with nonstick spray. In a medium saucepan, melt 1 tbsp. butter on low heat. Add ⅓ of the marshmallows and enough red food coloring to make the mixture your desired shade of red. Add ⅓ of the Rice Krispies cereal and stir until cereal is well coated. Press the mixture into your pan with buttered hands. Repeat the melting process with one more tablespoon of butter and 1/3 of the marshmallows, then add cereal. Press this mixture on top of the red layer. Melt the remaining butter and marshmallows. Stir in blue food coloring until it reaches your desired shade of blue. Stir in cereal and press into the pan on top of the white layer. Insert Popsicle sticks at equal distances. Cool completely before cutting into individual pops. How nice of you to share the recipes of these delicious desserts. I know how important this day is to every American. 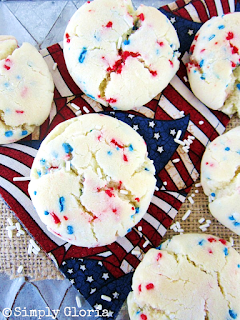 My kids school is organizing a 4th July event in one of the LA event venues and all the parents are supposed to send their kids with one of the homemade desserts representing 4th July. I am excited to make something out of these recipes. Thanks for sharing.